Enjoy a total pampering experience with a special person and experience 90 minutes of complete relaxation together in Sakura Day Spa's couples room. 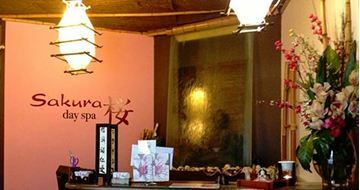 Sakura Day Spa is a modern Japanese-style day spa located in Brisbane and offers a range of soothing and calming treatments to women and men. Treatments are tailored and designed by the passionate Spa Therapists to deliver desired results. Do you know someone who needs a little stress relief? This is the perfect gift to treat your friend, colleague, mother or even yourself to a pamper experience. Give the gift of indulgence with this gorgeous pamper package at Sakura Day Spa. Whether it is a special occasion such as a birthday, or simply to say thank you to someone, treat them to this combo package and let them unwind and indulge for a few hours. The Sakura day spa allows you to relax and rediscover your inner self. This combination package will leave you calm, reinvigorated and ready to face the challenges of everyday life with new vitality. Indulge someone special with this ultimate relaxation experience including a signature massage,facial and body polish. This day spa is a modern Japanese-style day spa located in Brisbane and offers a range of soothing and calming treatments to women and men. Treatments are tailored and designed by the passionate Spa Therapists to deliver desired results.